Hello, I hope you are well. 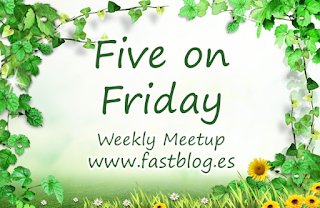 Today I'm joining with 'Five on Friday' and I thought I'd show you 5 new things that are 'happening' here at home. One - New life. M planted up my bulbs which were a Christmas present from family. I notice on the label that it warns against eating the bulbs! To be honest it hadn't crossed my mind and I can't help wondering at the 'Nanny State' sometimes. Surely those likely to be at risk, are the least likely to read the warnings anyway? The photo looks promising, and like all bulbs there's something special about seeing their flowers opening to the sun. Two - New on my blog. This weekend I finally got round to launching - 'Weekend Stitches' on my blog. This is something I've thought about doing for a while now and I'm hoping this will be the first of many. The squares themselves will feature many different patterns and when joined, will make a sampler blanket. Three - New book to read. Top of the book pile at the moment is the next book on the reading challenge. I bought this book from the CO-OP, one of their 2 for £5 deals last year. 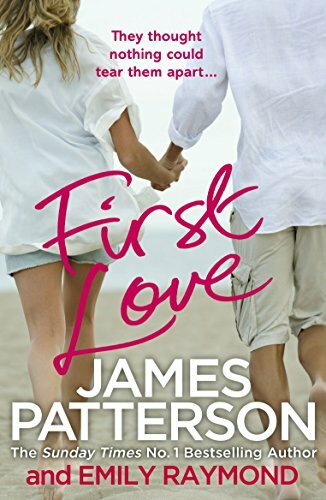 It's still not been read, so fits in with the 2018 Debbie Macomber book bucket list challenge - Read a book you already own, but haven't read. Four - New book club read. 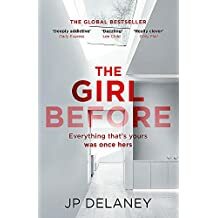 Also on the pile is The Girl Before by JP Delaney, this one is for the book club. Peter James describes it as 'a wonderful portrayal of psychological obsession at its creepy best'. I'm not sure that I'm looking forward to it, I read a book once that left me feeling sick inside for days. It was called - Behind Closed Doors by B A Paris. I wonder if I'm too sensitive but then again, apart from the book being disturbing, I thought the main (male) character was sick. I would say, why do people read these books, but that would sound stupid, as I did. A friend asked me why I finished it but surely that's the point of a 'gripping psychological thriller' isn't it, it grips you! You can't put it down. New - resting places. My precious boy QT, utterly adorable. As usual, he's relaxing and totally taking it easy. I love it when cats stretch out their front legs, they are totally at rest. Unless of course someone keeps pointing the flash in your eyes, oops! Sorry lad. The flash was off but the camera runs through meter readings before each shot. Thank you for visiting, do let me know if you've read any of these books and if you find learning new things, strangely exciting! I'm off to read other Five on Friday posts. I just finished listening to The Girl Before and I was riveted. I know you are going to love it. Have a wonderful weekend. I think your weekend stitches is a lovely idea, and being fairly new to crochet I will follow it with interest. The bulbs look stunning in the jug, such a lovely idea. I also love the idea of a sampler blanket, looking forward to watching it grow. I haven't read either of those books but I think it's a good idea to have prompts to get you reading things you wouldn't ordinarily choose, I often find I enjoy books which I didn't think I would. Lovely to see QT on the blog, he's such a handsome boy. Thanks Jo, QT is a very handsome boy and much loved by us. When we lived in Kent, the local library would regularly display books on a theme. They featured holiday reading, crime, also books by a chosen author etc. There were bookmarks available with a list of similar authors to tempt you to try other books. I've mentioned https://www.fantasticfiction.com/ before. It's a handy site to check other titles by an author. That's a good idea to plant bulbs in a jug. Pot plants have given me a lot of pleasure over these last couple of months. It's good to try new things and I shall find your crocheting tutorials helpful. Looks like so good reading.